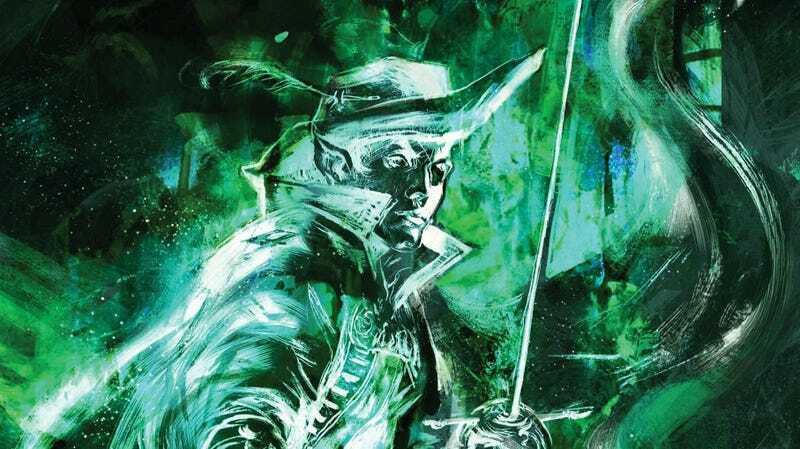 A crop of the cover of R.A. Salvatore’s Boundless; see the full reveal below. He could hear the labored breathing of his poor pony, but Regis didn’t dare slow. For the shadows within the shadows were not far away, black, misshapen things, lumbering and twisted by evil and unrelenting anger. Demons. Everywhere in the forest, demons. The halfling weaved about the trees, urging poor Rumblebelly on. He came down around a stone, the trail bending to the south, and into a clearing. He winced, noting the sheen of sweat on his pinto’s brown and white coat. At least now he could stop, but only briefly, and only because Showithal Terdidy, one of the leaders of the Grinning Ponies, rode onto the small clearing from the other direction. “Where is Doregardo?” Regis asked, pulling up alongside his friend. “And they’re all heading in the same direction,” Regis added. “All of us, Spider Parrafin,” Showithal corrected. Again, Regis shook his head. “Waterdeep must be told,” Regis explained. It was terribly hard for him to speak those words. He wanted nothing more than to turn about and gallop all the way back to Bleeding Vines, then ride the tram beside his beloved Donnola and his dear Rumblebelly all the way to the safety of Gauntlgrym. But he could not. Not now. In his previous life, Regis had been the tag-along, too often making victory more difficult for his beloved Companions of the Hall than helping them to achieve their goals – at least, that’s the way he viewed it. In those long-ago years, Regis had been the least of the heroes. This time, this rebirth, Regis had determined to change that course. He would be no burden. He would live as a hero worthy of the friendship of Drizzt, Bruenor, Catti-brie, and Wulfgar. Now his path was clear before him. He had to get to Waterdeep, the great City of Splendors, the Crown of the North, the most influential and powerful city in all of Faerun. The Lords of Waterdeep could turn back the demon tide, and Regis had to get to them. “If you’re on to Waterdeep, then you’re not riding alone,” Showithal insisted, moving his own pony up beside Rumblebelly. A commotion in the trees to the side turned the two. “Go!” Regis ordered, and he slapped the flank of Showithal’s pony, sending the mount leaping away, then quick-turned Rumblebelly and galloped off into the darkness in the other direction. Heavy footsteps followed him as he wove again through the trees, and buzzing loomed overhead, above the canopy. Regis didn’t believe it. He knew Rumblebelly would give him all that he asked for, but understood, too, that he would likely run his beautiful blue-eyed pony quite literally to its death. They were all about him. They were above, and, he found out to his great dismay, they were below him, for the ground to the side erupted suddenly, huge pincers snipping tree roots with ease, and the massive demon clawing up from the earth. A hulking, four-armed glabrezu emerged with long, loping strides, easily pacing Rumblebelly. Behind Regis, a vulture-like fiend leaped and half-flew, half-ran, in close pursuit. Rumblebelly’s breathing came in ragged gasps, and Regis knew that he could no longer outrun this pursuit. Still, he said, “No,” in denial, and he put his head lower, coaxing his poor mount ahead more swiftly, recklessly even, and hoped that he would not crash into a tree. No halfling had ever ridden a pony better than Doregardo, Showithal Terdidy fervently believed, and his dear friend was proving it to him yet again. Doregardo effortlessly took his black stallion through the tangle of trees, hardly slowing for the obstacles and brambles, anticipating each turn far ahead and leaning in, urging his pony ever forward, obviously confident that the animal would obey. That the mount had full confidence in him was just as obvious. A host of demons pursued Doregardo, including several he had cleverly and brilliantly pulled from their pursuit of Showithal. They would not catch Doregardo, Showithal believed. No one could catch the great Doregardo of the Grinning Ponies. He paced his mount down a slope into another copse of trees, the demons scrambling close behind. Despite his confidence, Showithal held his breath, and indeed grimaced when he saw those trees shaking violently and heard the growls and roars and shrieks of the fiends. But Doregardo came galloping out the side, he and his mount showing not a mark as far as the distant Showithal could see, and there was not immediate pursuit – indeed, the battle in the copse continued. Showithal Terdidy managed a smile despite the desperate situation. Doregardo had turned the demons back on each other, a tangling mess of clawing, biting chaotic frenzy. When the two rejoined in a small clearing a short time later, it was clear that Doregardo had bought them both some time. “Too many of the beasts,” Showithal agreed. As if on cue, the brush behind them began to shake violently and a pair of misshapen demons burst onto the clearing. The halfling pair were already away, though, Doregardo letting Showithal lead in a straightaway run for the distant halfling settlement, while he, Doregardo, went back into his forest dance. But more shadows loomed about their flanks, and a loud buzzing sound followed them overhead, and for all their efforts and all of Doregardo’s brilliant maneuvering, when the pair rejoined once more on a wide road further along, they knew that they were in deep trouble. They came together again soon after in another small clearing, now understanding the depth of their predicament. “Others will make it,” Doregardo said somberly to his friend. “We’ll make it!” Showithal insisted. Doregardo nodded, but clearly was not convinced. Nor was Showithal, for now the moving shadows were ahead of them, left and right in the trees. He kicked his pony and started away, but barely got moving, for Showithal grabbed his reins, holding him and the pony back. Doregardo looked at him curiously. “Others will get there,” Doregardo insisted. “No,” Showithal said softly. “You go, all speed. The two halflings, friends for all their lives, comrades-in-arms for decades, shared a long look, one of friendship and brotherly love. Still Doregardo shook his head. “You will make a waste of my valor,” said Showithal. Doregardo started to respond, but there was really nothing he could say. He didn’t believe that either of them would get out of the forest alive, but if one had a chance, given a head start here, it would, of course, be him. “Pray Regis…Spider, makes Waterdeep,” he said. Showithal nodded, but couldn’t find the strength to audibly respond. He yanked back on the reins, then slapped Doregardo’s black pony on the rump as it moved past him. Doregardo charged away and Showithal Terdidy drew his sword. It seemed a meager weapon indeed, measured against the hulking forms scrambling about the shadows. Excerpt from R.A. Salvatore’s Boundless reprinted by permission. Copyright Harper Voyager. R.A. Salvatore’s Boundless is out September 10, but you can pre-order it right here.